Their main demands include ensuring the Minimum Support Price for the crops, waving off the loans of farmers, and saying no to privatization of electricity in the state. 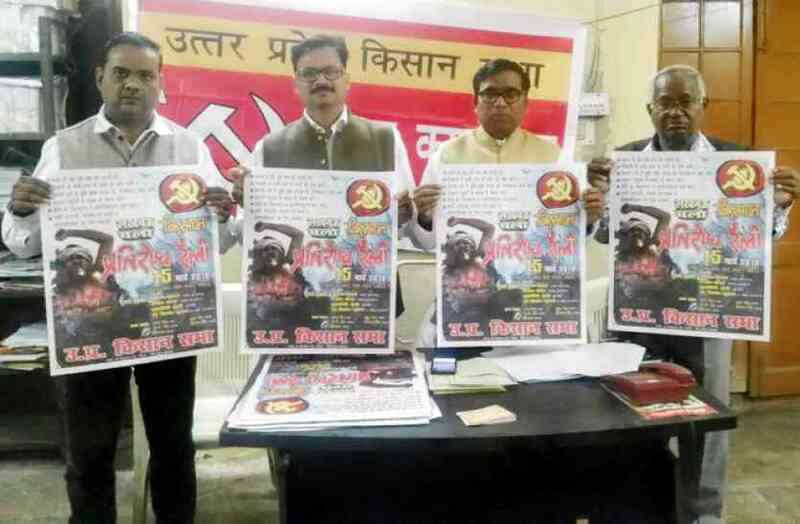 Following the victorious struggle of farmers and Adivasis in Maharashtra under the banner of All India Kisan Sabha (AIKS), their compatriots in Uttar Pradesh are all set to demonstrate a protest in Lucknow on March 15. In Maharashtra, farmers and Adivasis bagged a landslide victory after their seven-day long iconic protest and the BJP government was forced to accept the demands of the protesters. The Uttar Pradesh fraction of AIKS has given a call for a one-day “Kisan Pratirodh Rally” on March 15 seeking the demands of farmers in the state. The farmers who gather at Lucknow will put forward their charter of demands. Their main demands include ensuring the Minimum Support Price for the crops as per Swaminathan Commission recommendation, waving off the loans of farmers, ensuring affordable electricity tariff and saying no to privatization of electricity in the state. "The Uttar Pradesh government has increased electricity tariff since 2016 and now in 7 districts electricity is being given in private hands. The electricity prices have increased so much that the cost of cultivation has started to skyrocket. In the countryside, electricity prices have gone up to 150 times in the past. Also, the government has not taken any measures to ensure MSP,” Mukut Singh, Uttar Pradesh State Secretary of AIKS, told Newsclick. The farmers and peasant organization across the country have been demanding the implementation of recommendations of M.S. Swaminathan Committee report. The report, in 2006, had recommended a minimum support price of 50% profits above the cost of production classified as ‘C2’ by the Commission for Agricultural Costs and Prices. While talking about the loan waiver policy of Yogi Adityanath-led BJP government in the state, Mukut said: "it was clearly eyewash. Earlier, the government, in its resolution letter, had said that they would waive all the farmers' debt. But, later, they said that the scheme would be applied to small and marginal farmers." “In the name of loan waiver scheme, the government had insulted the farmers. Though there are 38 million small and marginal farmers in Uttar Pradesh, out of which only about 7 million farmers got the “benefits” of the scheme, that too, the cheque of Rs.50, Rs 1 rupee etc.” he added. The farmers also demand the protection of their crops from stray cattle, no to the privatization of farming, take measures to reduce rising crimes in the state, say no to communalism. The state has been witnessing the resistance of farmers for a long. Earlier, in January this year, the potato farmers had demonstrated in front the state Assembly building and had dumped their produces on the road. The production cost of one quintal of potato comes around Rs 1,000- Rs 1,100. But, the government had offered Rs 559 per quintal. This took the farmers to streets in January. The upcoming farmers protest in Uttar Pradesh is not an isolated case. It is the part of the ongoing struggle of farmers and agricultural workers all across the state. After Rajasthan, Madhya Pradesh and Maharashtra, it is the turn of Uttar Pradesh farmers to mark their protest against the anti-farmer policies of the BJP-led state and Centre governments.